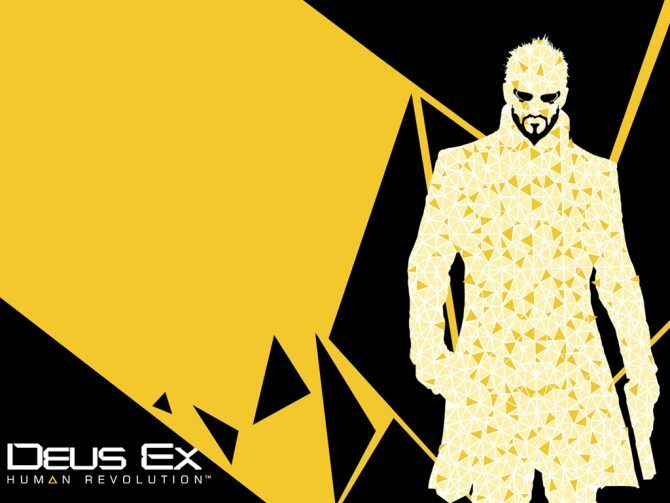 The Deus Ex formula is one that is notoriously challenging to perfect. The first game had a mastermind, Warren Spector, behind it. The second game lacked the vision he had, and suffered for it. 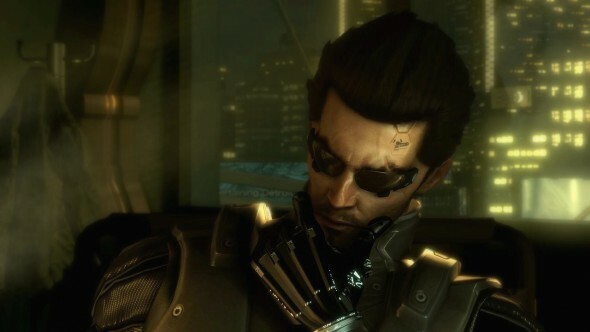 So myself, and many other fans of the Deus Ex series were rightfully concerned by the creation of the third game. Of course we were still excited, but that excitement was matched by a feeling of nervousness. So, is Human Revolution closer to the first game, or does it suffer from similar pitfalls that its predecessor, Invisible War did? Read on to find out. Before you scroll down the page to check the score, let me assure you, this game is no Invisible War. Human Revolution manages to address almost every complaint I had with Invisible War. 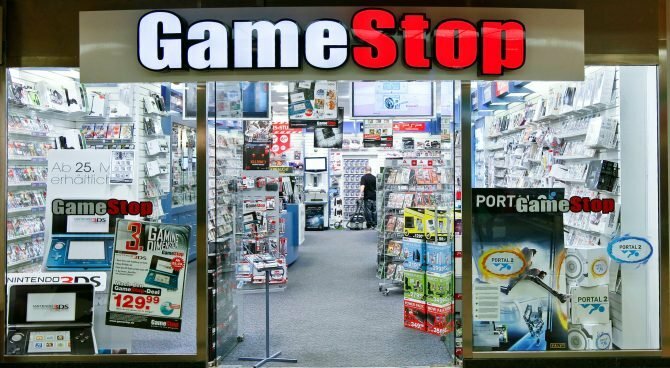 It falls back on what made the first game so amazing and then goes further with the technology available to truly make itself stand out like few other games have. It is both original and nostalgic at the same time. The game manages to take just the right amount from other games to create something new, interesting and most of all, fun. Usually, when a game is delayed, it is not a good sign, but Eidos Montreal and Square-Enix put just the right amount of polish to create this masterpiece. To begin with, the graphics are fantastic. The color palate of Gold and Black contrast the blue and orange or mud we see in so many other games. It gives the game an impressive visual flair, and manages to make every level feel both futuristic and oddly enough, somewhat familiar. The city streets look appropriately dirty and somewhat downtrodden, but the corporate locations all look pristine and almost utopian in their moderness. Further, the environments provide some surprisingly jaw dropping moments, just out of sheer creativity and coolness. I recommend looking out the first window you get to in the upper city of Hengsha. The character models are great, and there are some very nice touches, such as guns that grow to look different when you upgrade them or the newspapers that you can pick up that can change as you read them. The whole game just feels like the developers put a lot of care into their creation. Two of the only real gripes I have with the game, and these are minor, but they should be mentioned, are some bland textures and modeling (the cars on the street are an example), and the voice acting. I actually liked the choice of voice actors. However, the actual lip synching always seems off, and it doesn’t always appear that the character on screen is saying what I was hearing. 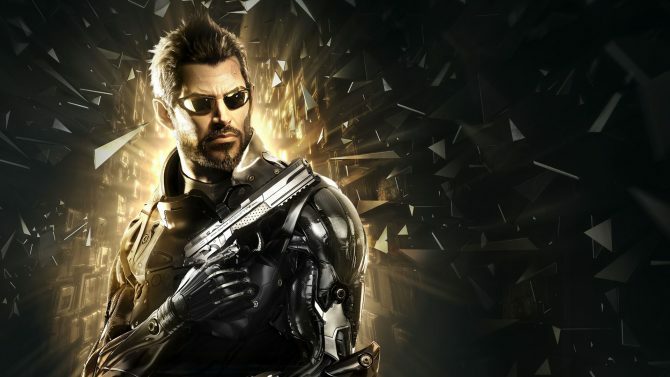 I have heard complaints about the pseudo-Christian-Bale-as-Batman voice for the main character, Adam Jensen, but it is actually not a bad choice, as it fits the cyberpunk world very well. Speaking of cyberpunk, the story of Human revolution actually manages to stand as even better cyberpunk than either of its predecessors. The story is clear, less convoluted and actually makes more sense. The story questions what it means to be human, and does a good job. One of the most brilliant aspects of the game is that it forces the player, via Adam, to discuss the philosophy behind each major character’s motivations. It makes the player actually a participant in the discussions about humanity, augmentations and the philosophy behind each viewpoint. By rewarding players experience, gameplay and added story bonuses for correctly figuring their way through a conversation, it makes sense to listen to what characters have to say, and then deal with them appropriately. One of the many augmentations, a social monitor, is great for this and rather than make the conversations easier, actually makes them more interesting and engrossing. At the same time as the story is clearer, it also has all of the Deus Ex trademarks, modified people, global conspiracies and even the illuminati. However, the actual illuminati elements are downplayed to perfection. They aren’t as silly and obvious as they were in Invisible War and they aren’t quite as convoluted and open as they were in the first Deus Ex. The whole game is more structured around corporate espionage and actually feels cooler and more original for it. The story also includes some very nice touches, as many characters from Deus Ex make cameo appearances, through emails sent or even appearing briefly in game. There are also a lot of minor humorous references, such as throwbacks to Robocop or hints that by 2027 Square-Enix will be up to Final Fantasy XXVII. The little touches work really well to settle the games world as one that is not all that fantastic and one that is more realistic. All the story and graphics would be for nothing if the gameplay of Human Revolution wasn’t good. But it is. 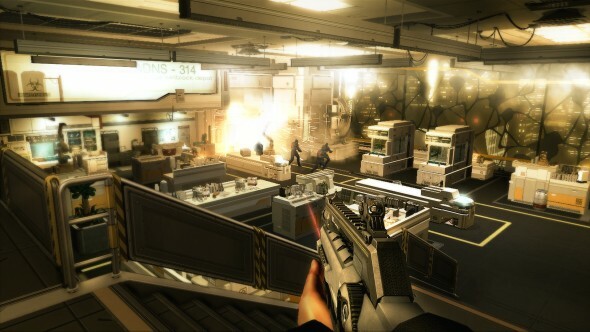 The game is played from a first person perspective, but uses a similar cover system to Rainbow Six: Vegas. The advantage of that is that it fixes the problem of the lack of peripheral vision. With this cover system, the stealth aspects of the game really shine. And they needed to. You may be an augmented super-spy, but bullets are still your biggest weakness. 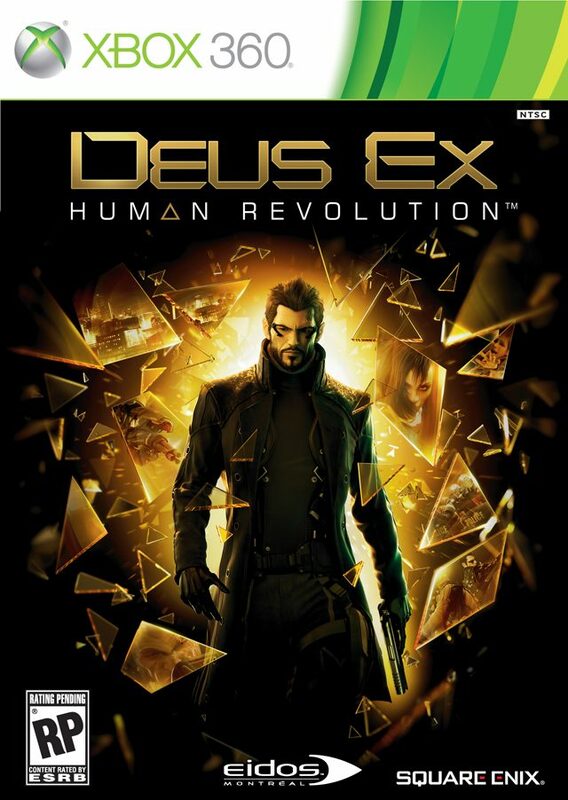 I played through the game on the “Give Me Deus Ex” difficulty, the hardest one and you did not want to be seen. The stealth system is good, but so is the enemy AI, if you make a noise, they will investigate, and I never ran into a “dumb” enemy. To play the game stealthily, real patience is required to learn an enemy’s route and then silently take them out, either through weapons or through one of the cool 3rd person takedowns. However, patience and stylistic takedowns are not the only key to successful stealthiness. A healthy curiosity will also help, as there are air vents, ladders and all manner of different routes to help you through the game. Exploration is one of the keys of the game, and it is really rewarding to find a vent that leads you past a room with six or seven guards. The game really shines when you realize that outside of the “hub worlds”, the combat based levels are almost all linear. Human Revolution is able to make them feel like they aren’t. The various paths through a level really make a difference and if you are having trouble solving a level one way, the game allows players to think and be creative and find another way through it. The Augmentations you can get really help this out too. The hacking upgrades and the aforementioned social modifications add a lot, especially since the hacking mini game is actually a lot of fun, and occasionally a really nice challenge. I found myself using almost every augmentation I purchased, and sometimes, deciding which augment to pick or upgrade when I had praxis points (essentially your reward for leveling up, though they can also be found or bought), was quite a challenge. There are a lot to choose from, and many are very helpful. Some aren’t, but by the end of the game I had more than enough to get every upgrade I wanted. I had expanded my inventory, gained faster recharging battery cells was immune to EMP and could cloak for a period of time long enough to get out of even the worst of situations. The experience and augmentation system is really well designed and the only problem I really had with it was that sometimes it really was hard to choose which augment to get next. The combat is also really well designed, and works well with the cover system. So while you really don’t want to alert guards, if you do, it’s not immediately game over. Further, it is possible to make it through the game killing only a minimum amount of people as well and this adds a nice challenge as well. 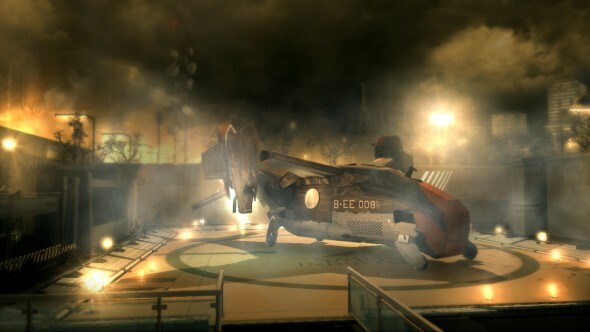 However, this brings me to perhaps my biggest complaint about Human Revolution – the boss fights. While the boss fights aren’t quite as bad as I was expecting, they are very different from the rest of the game. There also are not that many of them and they are very spread out through the game. Still, at least one of them had me wondering how to get past. The Human Revolution’s boss fights require the player to really think differently than they have been. As I was stealth oriented, I still made sure to carry a lethal weapon. However, grenades and other gadgets, alongside some creative thinking can also get you past these boss fights. Still, the biggest issue I have is that the boss fights break the pace of the game and almost feel left over from another, older version of the game. Still, through creativity and quick thinking, they can be beaten. Deus Ex: Human Revolution is a masterpiece. 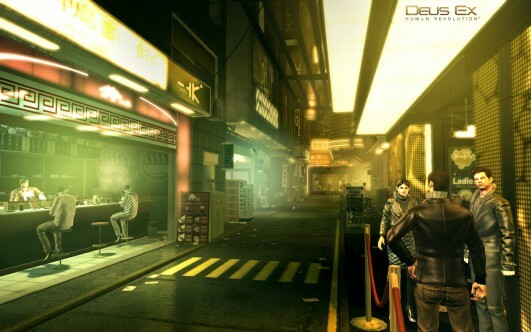 Not only did it nail the formula of the original Deus Ex, it took the time to improve on it, with better stealth, a clearer, yet still clever conspiracy, cities that really feel alive and creative exploration. Human Revolution never underestimates or condescends to the player, instead, the game really allows the player to think for themselves and make decisions. One of the great things too, is that the decisions you make are not all about the specific gameplay consequences, though they often are, but are just as often about the story consequences and involving the player in the game’s world. The game has some very memorable moments and I found myself staying up two nights in a row for extended marathon sessions to complete it. 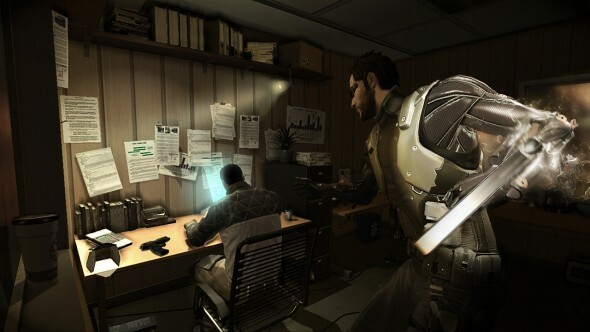 Deus Ex: Human Revolution has it all, the story, the gameplay, the graphics and all other minor things that make a game great. I know there is a lot coming out this year, but Human Revolution is already one of the best games I have played in a while and that makes it very easy to recommend. Review Copy Info: A copy of this title was provided to DualShockers, Inc. by the publisher for the purpose of this review.